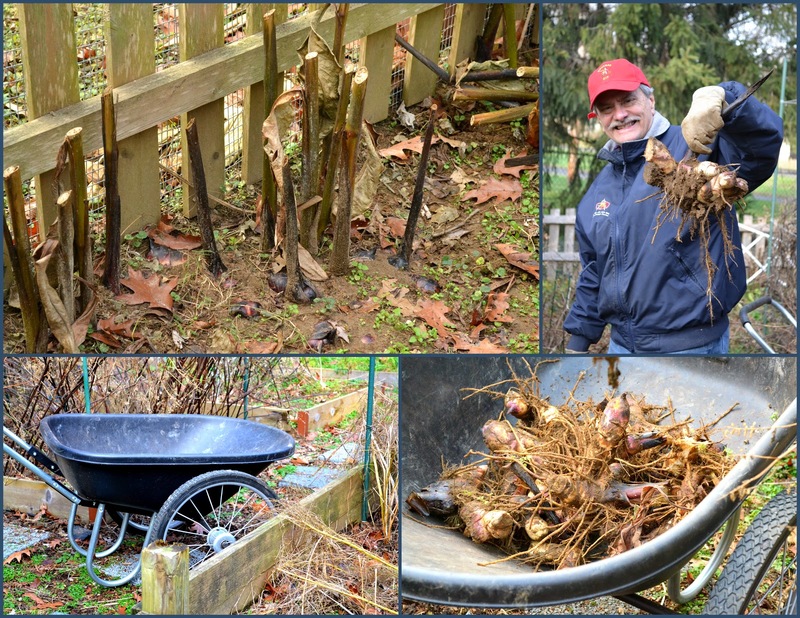 As the Winter season fast approaches (officially December 21), there is still time to clean up yards and gardens. Have you cleaned up your garden? Ours is a work in progress. Today, we got out there since it was a fairly mild day for December in New Jersey. We prepared our asparagus bed for the winter and finally dug up our canna and dahlia tubers. If you grow asparagus, which is a long-lived perennial, you know that the tops grow into ferns and eventually turn brown and die back at the end of the growing season. If you haven't done so already, now you can cut the dead ferns off to tidy up your asparagus bed for the winter. We also like to pull up any dead veggies and herbs like tomatoes and basil and get the debris out of the garden. Doing so gives less opportunity for insects and disease. And, if you grow flowers like cannas or dahlias, it's not too late to dig up the roots and tubers and store them inside over the winter. If you leave them in the soil all winter, chances are they will rot by spring. We dug ours up today and put them in heavy duty plastic bags filled with peat moss to absorb any excess moisture. We store the bags in our basement until spring. Don't forget to put seeds on your holiday wish list for your 2013 Garden. I highly recommend trying Swiss Chard. Our Northern Lights Swiss Chard has been harvested literally all summer right up until now. Happy Holiday's, Gardening and Healthy Living!